Most homeowners have heard that getting an annual furnace check-up by a licensed technician is recommended by their heating company. However, very few of them actually take this recommendation seriously, which can have rather dire consequences when neglected. If you’re one of these people, it’s important to understand that there are valid reasons for this suggestion and an annual furnace inspection and tune up are necessary maintenance jobs that will keep your furnace working properly for years to come. Those who don’t think yearly maintenance is necessary often wait too long, until it’s too late and something actually breaks down, costing them more headaches and much more money than what a simple routine maintenance check-up would have. A broken furnace is no laughing matter. In fact, a furnace that isn’t running properly is prone to breaking down. So, if you’re looking for an Oshawa furnace repair, it’s important to contact a local HVAC contractor as soon as possible to avoid getting caught in the cold. Below, we’ll go over a few of the benefits of an annual furnace tune up. Annual maintenance isn’t only recommended to keep your furnace running at optimal levels, it also helps keep you and your family safe when you’re heating your home. When your furnace produces heat, it burns fuel such as propane or natural gases. Therefore, an annual check can help make sure that your furnace is burning fuel efficiently, as well as being safe and free of unnoticeable leaks. I’m sure that we don’t really need to explain that a natural gas or carbon monoxide leak can be an extremely dangerous situation. These types of leaks are hard to detect because gases such as carbon monoxide are colorless, odorless and tasteless. Furthermore, a gas leak can cause symptoms such as nausea, painful headaches, stomach cramps, and if the leak goes unchecked, even death. 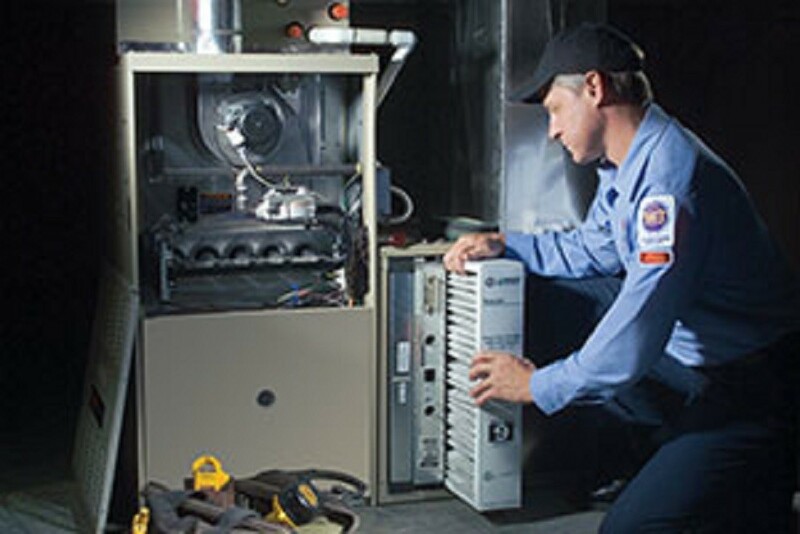 Therefore, getting an annual furnace tune up can help you catch any potential risks before anything bad happens, which is sure to give you peace of mind knowing that your furnace is safe to use and working properly. As you probably already know, running your furnace when it gets cold can sometimes make up for as much as half of your total energy bill. And that figure can add up quickly, especially if you live in an area that suffers from long, harsh winters such as Canada or the norther parts of the United States. However, routine furnace maintenance can help you save money on your heating costs by making sure your furnace is running efficiently and using no more fuel than necessary. In fact, according to some studies, regular furnace maintenance could end up saving you as much as 30% on your total yearly energy bill. Also, keep in mind that an annual check-up from a licensed professional is only one small part of furnace maintenance, and while you might not like the idea of doing any extra maintenance work, taking care of your furnace is not as hard as you might expect. Simple maintenance tasks such as cleaning your ducts or changing your furnace filter can also help you save money on your bills. Having clean ducts and filters allows your furnace to heat your home effectively, without consuming any more energy than needed. This also helps improve airflow through the duct system, which will reduce the risk of damage being caused by any excessive strain being put on your heating system. Read more about DIY furnace maintenance here. It’s no secret that furnaces are expensive and repairing them can be an extra cost that anyone could live without. Therefore, it’s important to get regular furnace checks and tune-ups in order to maintain your manufacturer’s warranty. Most high-quality furnaces will come with either a 5 or 10 year warranty option. However, these usually state that the furnace must be properly maintained or else the warranty will be void. Since most furnaces can last upward to 20 or 30 years, it’s important to regularly check on your furnace and make sure that it remains covered under warranty for as long as possible. In the event that something does happen to your furnace and you need to use your warranty coverage, the manufacturer will likely ask you for the furnace’s service records to prove that it’s been cared for. And if you’re unable to prove that the furnace has been maintained, you probably won’t have any luck getting your repairs covered. In other words, paying for an annual furnace inspection and tune up is the absolute best way to ensure that your warranty will be maintained. If you get an annual furnace inspection and tune up during the fall, you’ll be able to get a good idea of whether your furnace will work efficiently throughout the entire winter season. The last thing you need in the middle of a January deep freeze is to be woken up in the middle of the night because your furnace decided to give out on you. Therefore, getting to know what condition your furnace is in before winter kicks in will give you peace of mind and save you a lot of grief in the end. Think about it this way, if in the fall, you find out that your furnace is on the brink of a breakdown, you’ll still have plenty of time to get it repaired or replaced before the cold weather really sets in. As we’ve already mentioned earlier, furnaces are a rather expensive appliance that can last for as long as 20 or 30 years if properly maintained. Therefore, it’s important to take proper care of your furnace or else you risk facing frequent breakdowns and repair bills that can easily be avoided with a little bit of routine maintenance work. Remember that your furnace is your best friend when it comes to surviving the winter months. This means that you need to take proper care of it and in the end, it will keep you safe, happy and warm whenever the cold winds start to blow.